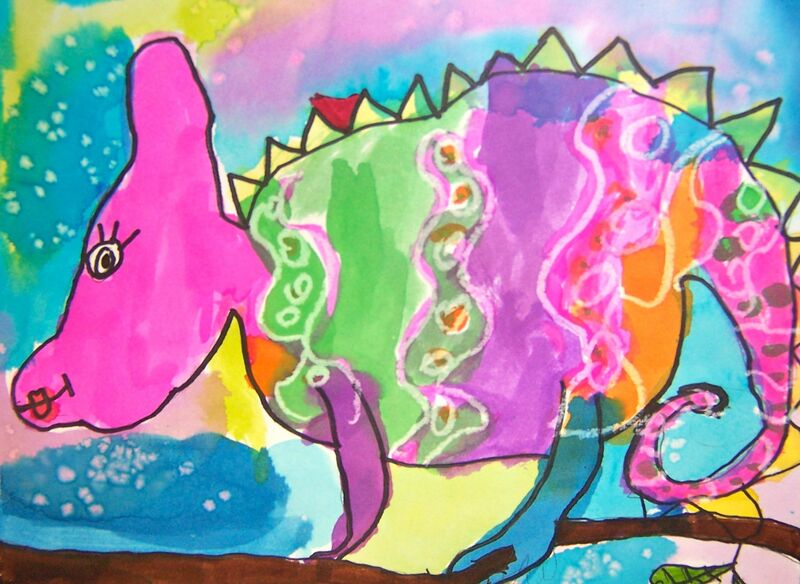 We started this fun painting project with some guided drawing lessons. 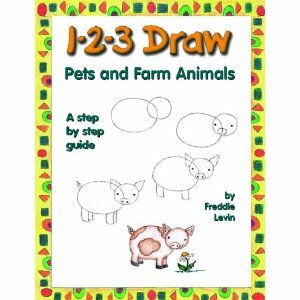 We drew several kinds of lizards using this resource – 123 Draw Pets by Freddie Levin. We drew our lizards on a nicer, heavy weight drawing paper and I really encouraged the students to draw large! Next, the students traced over their pencil lines with black Sharpie. The details such as the stripes and dots were drawn with white oil pastels. Then we painted! 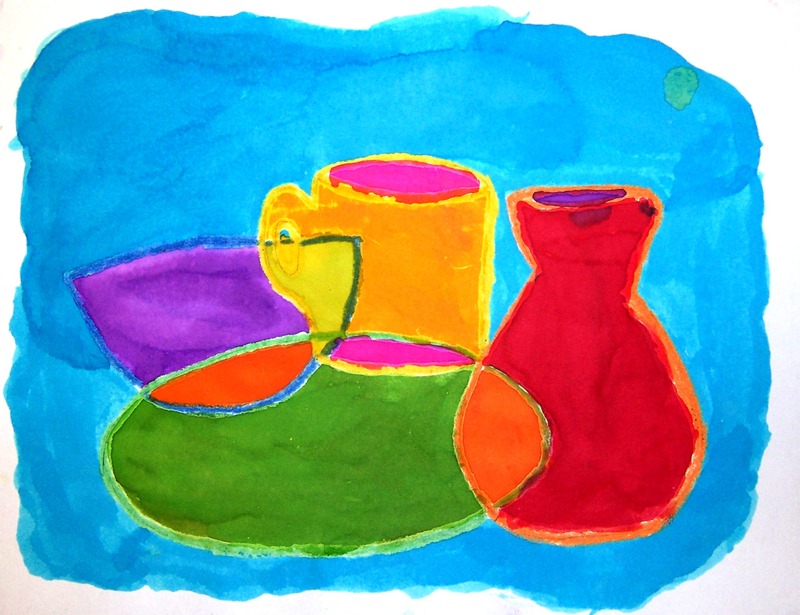 At each table, I set out liquid watercolors in warm color sets or cool color sets and a small cup of kosher salt. For the watercolor demonstration, I showed kids wet-on-wet: painting one color, then while the paint is still wet, adding another on top to blend.While the paint is still wet, sprinkle some salt to create small twinkles of star-like dots. 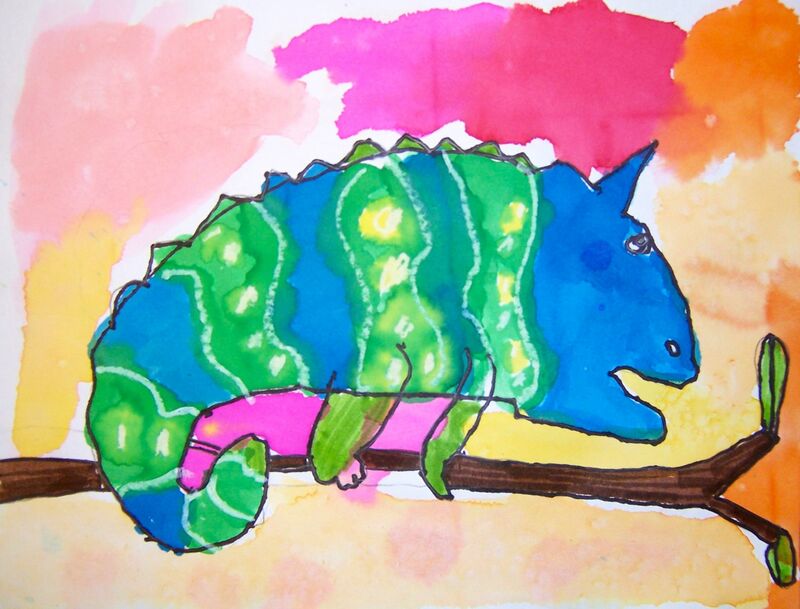 Wet-on-dry: Since this lessons takes 2-3 classes, once one section of the chameleon is dry, they can then paint over that section to create spots, stripes, dots, etc. as well as the branch and leaves. Look at the fun lips and eyelashes! First graders add the cutest details! 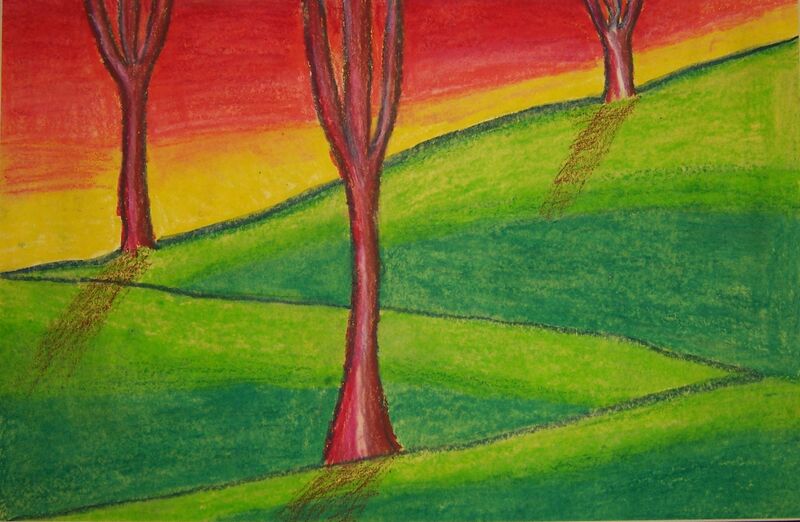 My fifth graders just finished these gorgeous landscapes drawn with water soluble oil pastels and blended with water. 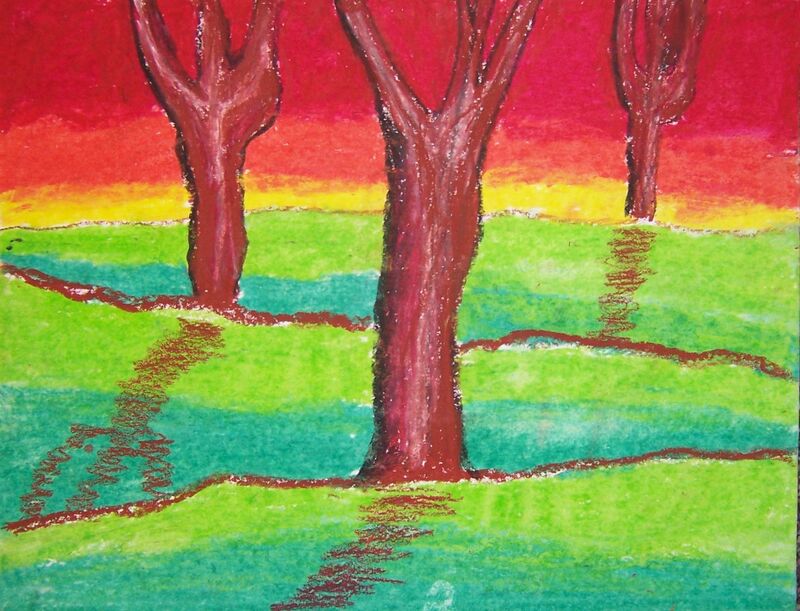 Students used paper turned horizontally and divided the paper into three layers representing foreground, middle ground and background. Tree were added next, with one tree at each line, and got smaller toward the back of the paper – showing depth. The trees are colored in last. Students added shading to indicate a light source. Last, they blended and softened lines with water. I gave students choices with their color palette. They could use a palette of cool colors or a combination of warm and cool colors, with one that is dominant. 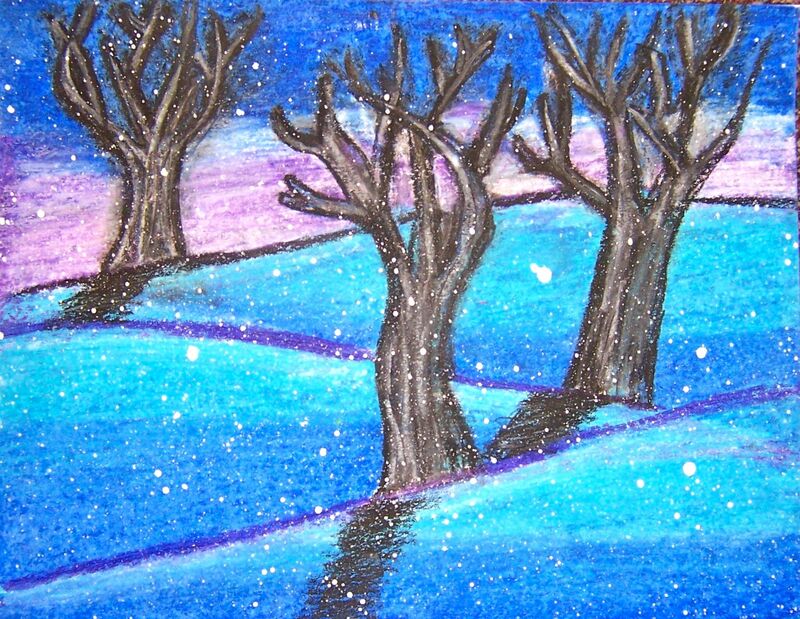 Cool colored landscapes got a light splatter of white paint to include snow. I think they are beautiful and the students were very proud of the way the landscapes turned out. Enjoy Cooper, Sydney, and Grace’s artwork! This is what we’re doing in third grade right now. My main goal is to reinforce painting skills: practice painting simple shapes and to leave white space around the painting. I love the painterly look it creates, and think this will be a nice change from painting to the edge, which we almost always do. 1. We first watched a DVD called Drawing For All http://www.dickblick.com/products/crystal-productions-drawing-for-all-dvds/ Students practiced drawing cylinders, spheres, etc in a traditional still life that was set at each table.Then I asked them to use these shapes again, overlapping on their watercolor paper, and trace them lightly in pencil, and again in crayon. The harder they press down with the crayon, the better the “wall” they make to keep the paint from running together. 2. Using watercolor trays, they painted in all the different shapes different colors, jumping around from spot to spot and trying not to paint wet areas next to wet areas. 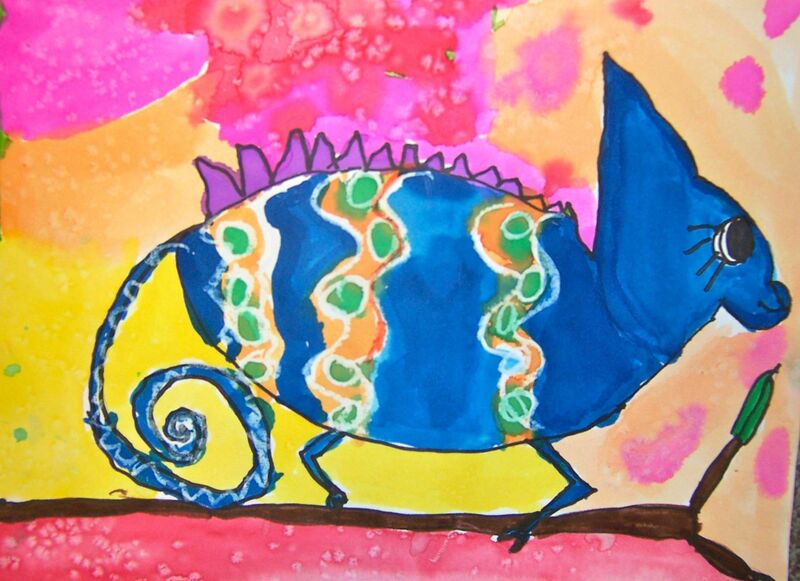 Enjoy this painting by third grader Morgan S.